The very popular, anti-establishment site called the Daily Sheeple has been axed. Nukepro? 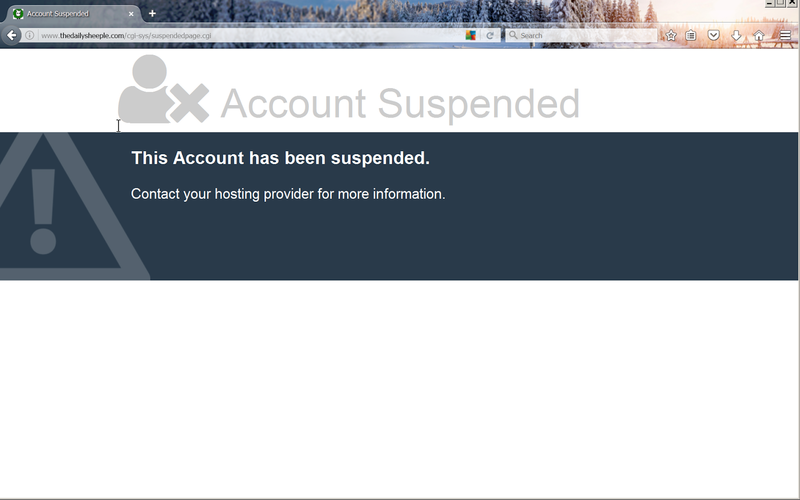 LOL hosted with a Google blogger account....time for a change! And a complete archive. Friday night, the Facebook co-founder Mark Zuckerberg went on his vast social network to convince an expanding chorus of critics — including the departing president of the United States — that he honest-to-goodness wants to combat the “fake news” that is running wild across his site and others, and turning our politics into a paranoiac fantasy come to life. stock here -- so I guess "conspiracy theory" isn't strong enough, not deplorable enough, so they up the ante to "paranoiac fantasy come to life"
When the public get the whole story of Podesta's "Spirit Cooking" and other tidbits sure to come out and further convict the sociopaths and apparently child molesters that thrive on power over humans and have risen to the top of the pyramid. A search of the NYT for "spirit cooking" turns up zero results. They must have "fake news" at the NYT, because a Google search brings up all kinds of results. Citizen journalists, citizen scientists,citizen lawyers... are there any formally trained professionals left? The establishment has failed itself and failed us. Science has just become a political tool for manipulation. And the scientist like Cullen Buessler that are paid to lie about "safety" of massive radiation in our environment should be given Nuremberg Trials. Shame on them. Then interesting enough, after my comment on Zero Hedge, Zero Hedge become targeted as "fake news"